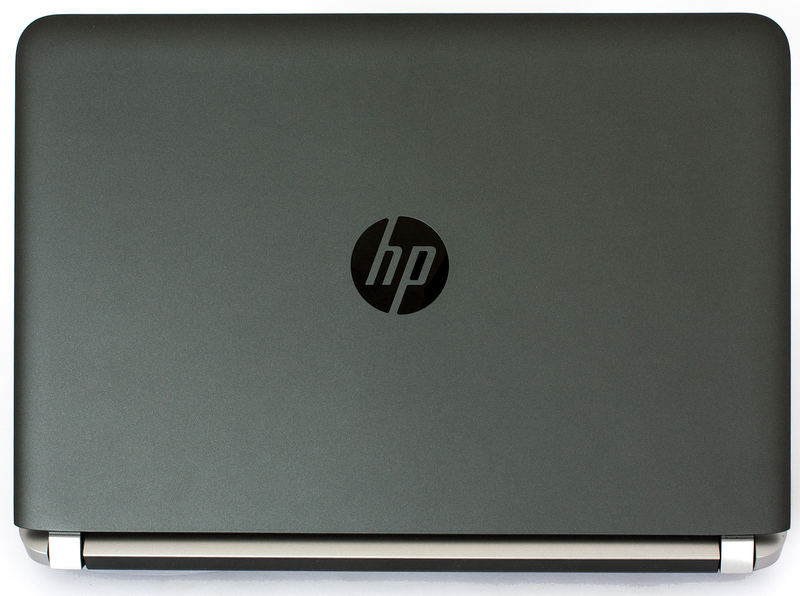 HP has been well-known in the business class on the market for quite some time now and it would be a big miss not to turn a bit of attention to the budget-oriented ProBook 440 G3. Although it’s aimed at more strict business-oriented users, the notebook will gladly serve to users that are only looking for a compact 14-inch device at a decent price. It won’t surprise you with exceptional performance or stunning image quality, but it does well for what it’s made for – working. The keyboard and touchpad are almost spotless given the price point and the aluminum frame around the keyboard gives that elevated feeling that you get from higher-end models. Furthermore, the unit we got boasts a 7200 rpm HDD, which is really notable and all that costs a bit more than €500. If you are willing to spend a bit more, you can supercharge your ProBook 440 with an SSD paired with the fast 7200 hard drive. However, this doesn’t apply to most regions. While we were able to acquire our unit for around €500, the official price in most of the countries is more or less… disturbing. The US customers will have to pay around $900 while the UK market is selling the laptop for around 1 000 GBP and it’s easy to see that there are much better choices out there for the asking price, which include IPS panels, better specs, and overall better ergonomics. The box containing the notebook comes with the usual AC adapter, charging cable, the battery and the notebook itself. There’s nothing out of the ordinary, which you won’t find in other similarly priced notebooks. As we mentioned earlier, this might be one of the key selling points of this product. The build and design are just flawless given the price point of the notebook. 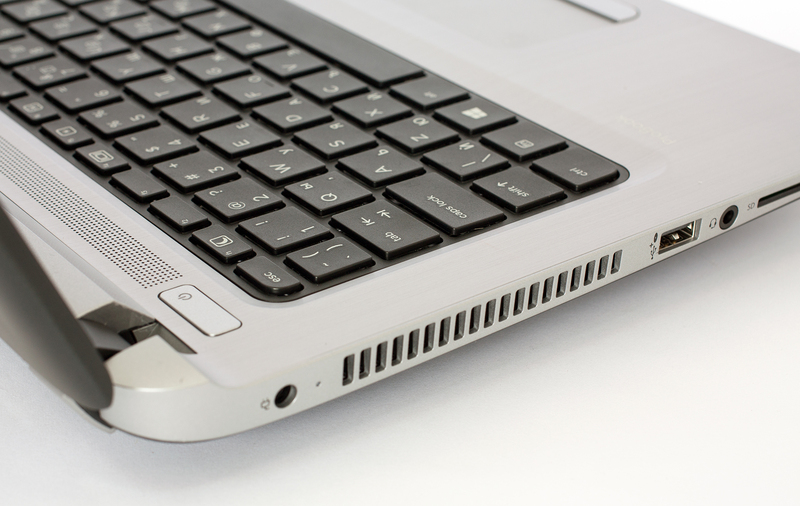 We didn’t find the usual build inconsistencies that are quite prominent in other budget laptops. 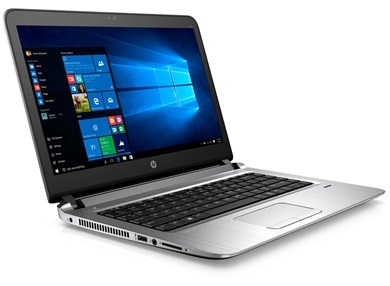 In fact, the ProBook 440 G3 can actually surpass most of its competitors and despite the high price in some regions, the laptop is still a compelling choice if you are looking for a trustworthy, compact and solid 14-incher. The lid of the notebook is made of soft-touch matte plastic, which is quite pleasant to touch and at the same time providing secure grip while carrying around, but the downside is that the surface attracts fingerprints and greasy smudges. Also, the center of the cover gives in under pressure, yet not so much to raise any concerns. The hinges supporting the lid are a bit small and overly tightened, although you can still open it with one hand. The base will lift up a few centimeters, though. As for the bottom piece, it’s made of hard black plastic featuring a big service lid hiding the usual upgrade options like 2.5-inch drive, M.2 SSD slot, and RAM chips. Going around the sides, you will see a different choice of materials. The edges around the machine are flat and made of silver-colored plastic. The left side accommodates the main exhaust vent with one USB 2.0 port, DC charging slot, 3.5 mm combo audio jack and the SD card reader. 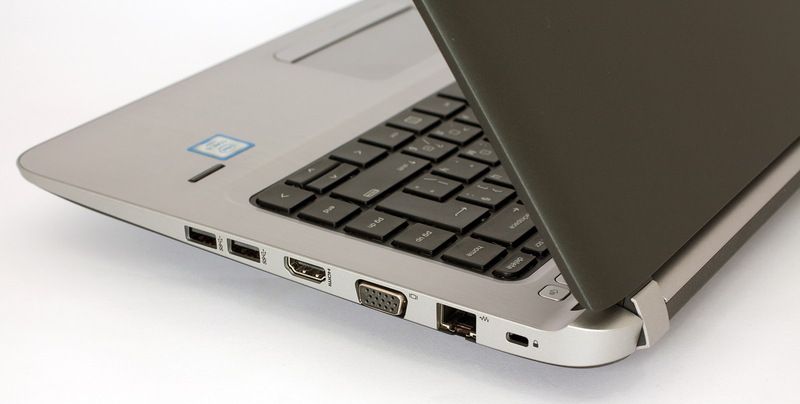 This leaves the right side with most of the ports making it a bit overcrowded – two USB 3.0 ports, HDMI, VGA and LAN port. Imagine the following scenario: you have a working space, which is a bit small, so you have to connect all the needed ports on the right and there’s little room left for you to use the external mouse, for example. It’s not a major drawback but it’s a detail worth noting. Since this is a business-oriented notebook, we can’t expect anything less than a good keyboard and touchpad experience and fortunately, the ProBook 440 G3 delivers. The keyboard tray is a bit concaved compensating for the long key travel that the keys offer. It’s not a full-sized keyboard since this is a 14-inch machine, but the typing experience is flawless. The same goes for the touchpad. It consists of the usual trackpad area, which is a bit small, to be honest, but registers all the gestures and swipes accurately, Also, the thumb rests naturally on the mouse buttons and it’s quite easy to get used to it. 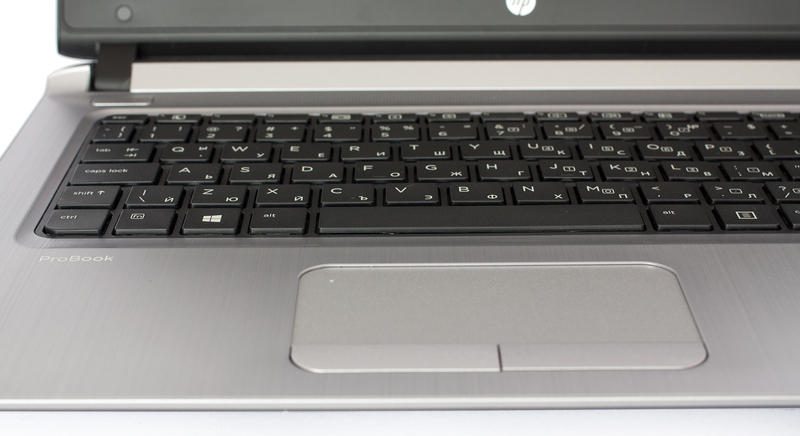 Both input devices are surrounded by gray brushed aluminum finish, which is more commonly used in higher-end notebooks. It definitely feels nice and sturdy. And we can’t miss mentioning the awkward placement of the fingerprint sensor. It’s not that it doesn’t work, but it’s not easily distinguishable, especially when the keyboard lacks the LED backlight. It’s really hard to assess the notebook given the huge price difference in various markets. For example, the keyboard lacks LED backlight and this can be considered as a great disadvantage if you get it for $900, but if you are getting the notebook for €500 – it’s more than acceptable. However, the build quality and choice of materials is a big step in the right direction no matter the price point. 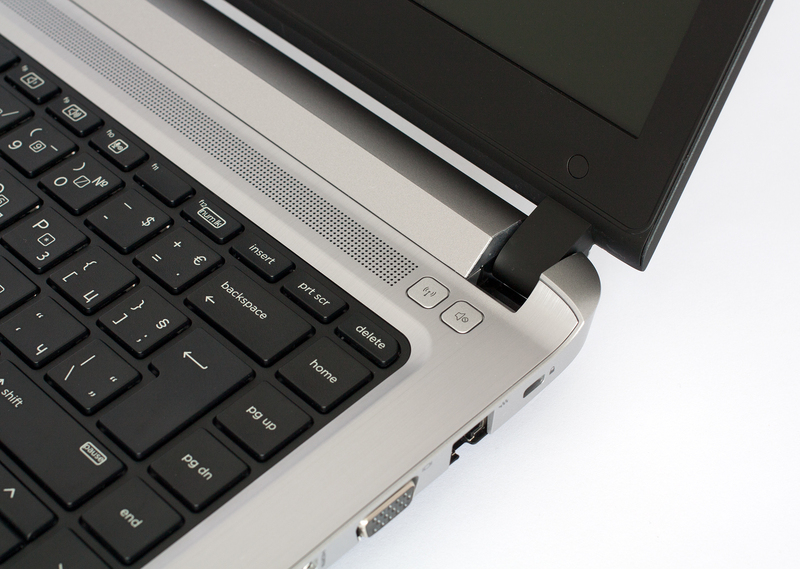 It’s relatively thin (21.1 mm), light (1.67 kg) and has excellent input devices for more than just “working on-the-go”. In fact, they can easily replace the external mouse and full-sized keyboard. 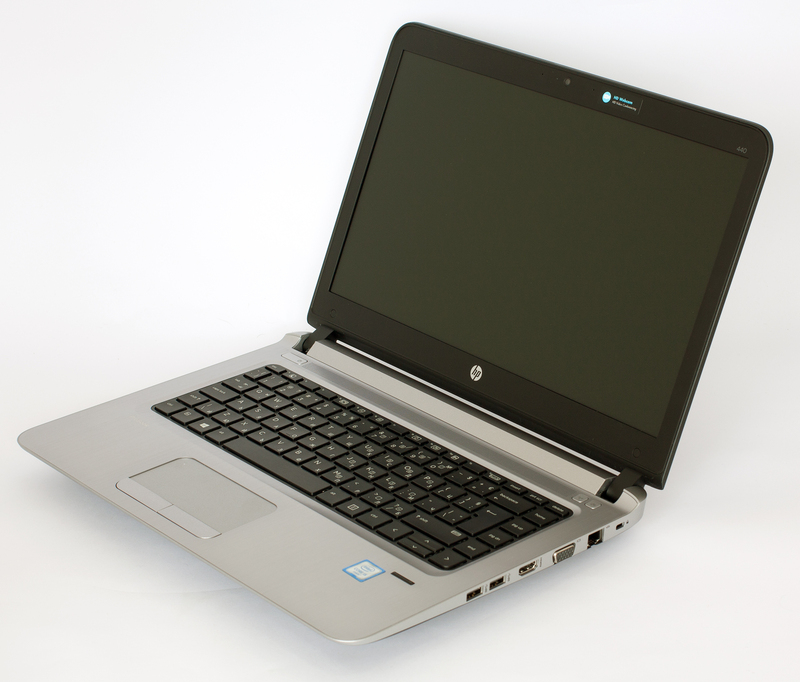 HP ProBook 440 G3’s panel uses a WXGA TN panel with 1366 x 768 resolution with a 14-inch diagonal. This leads to a pixel density of 112 ppi and 0.227 x 0.227 mm pixel pitch, so the screen can be considered as “Retina” if viewed from a distance equal or greater than 79 cm. The viewing angles are poor due to the use of a TN panel. We were able to detect 226 cd/m2 as maximum brightness and 13% deviation on the surface. The maximum brightness might be insufficient for some users, especially the ones who will use the laptop near a bright light source or outdoors. The native color temperature is 7460K, which is colder than the optimal 6500K (D65). 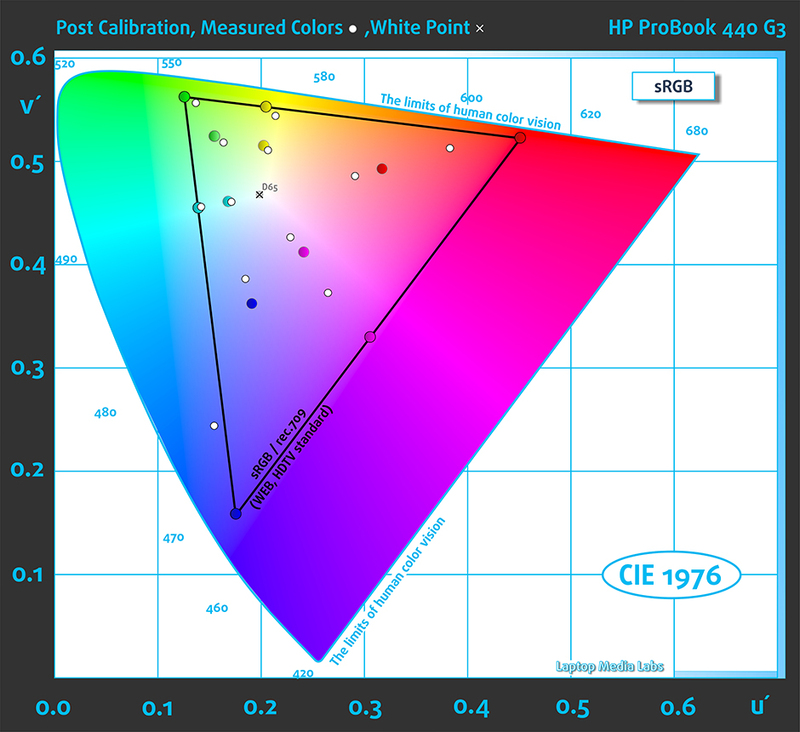 You can see the color gamut coverage of the ProBook 440 G3’s panel – around 60%. This is pretty low and the colors will not appear with enough saturation. Below you will see practically the same image before calibration. Color circles represent the reference colors and white circles being the result. You can see main and additional colors with 100% and 50% saturation inside the sRGB gamut. The profile has been set to 140 cd/m2 and optimal white point – D65 (6500K). Below you can see the results from the accuracy color checker with 24 commonly used colors like light and dark human skin, blue sky, green grass, orange etc. You can see the color accuracy on the images below. Unfortunately, the notebook’s screen uses PWM to regulate screen brightness and the frequency of the emitted light is quite low (200 Hz) and can be considered as “aggressive”. The negative impact on one’s eyesight is more prominent. The PWM is absent only at 100% screen brightness. Despite the low price of the laptop in some regions, the image quality of the display is pretty mediocre or in other words – we’ve seen way better. It has unsatisfying viewing angles, which is understandable for a TN panel, but the low maximum brightness and poor sRGB coverage weight on the cons list. Also, the panel uses PWM across all brightness levels (0-99%) and pulsates at really low frequency – 200 Hz. This is considered to be aggressive and will affect one’s eyesight. The sound quality isn’t all that bad – low and medium frequencies the loudspeakers produce clear and crisp sound but at there are some distortions at higher frequencies. We used a freshly installed Windows 10 (64-bit) for the writing of this review. 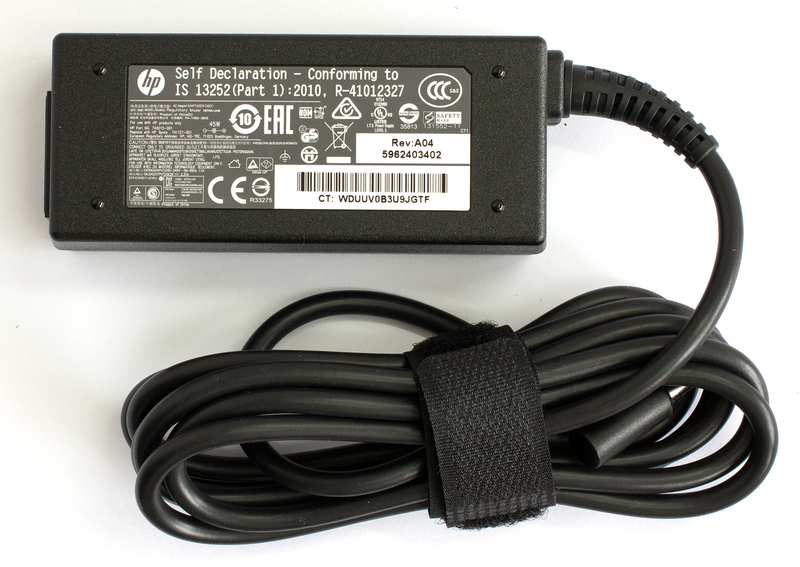 You can browse HP’s official support page to find the latest drivers. 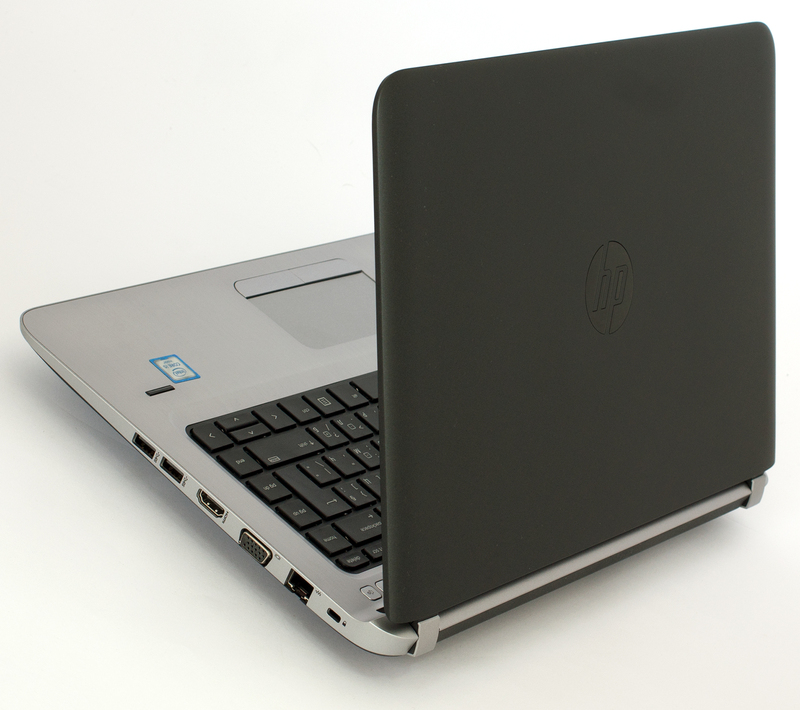 The laptop holds relatively big battery rated at 44Wh so given the small 14-inch HD panel and the ULV (ultra-low voltage) processor, we expect excellent results. 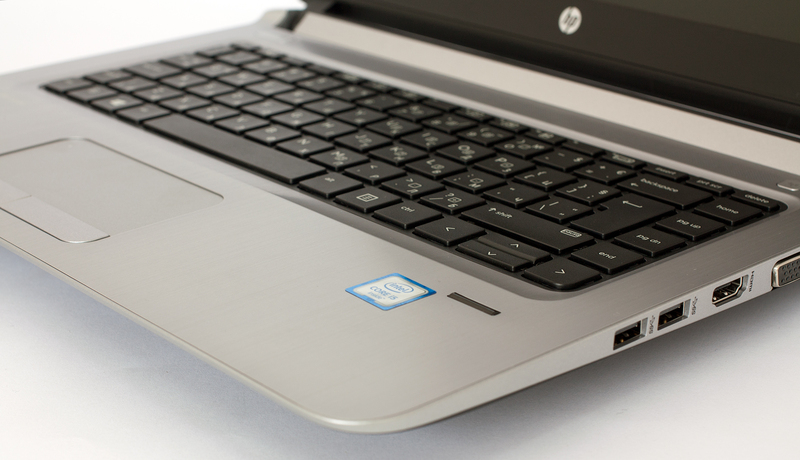 Luckily, the HP ProBook 440 G3 did not disappoint. The results below are pretty high and the Wi-Fi browsing test can be easily compared to higher-end laptops and even ultrabooks. That’s definitely one of the key selling points of this product. All tests were run with the same conditions as always – Wi-Fi turned on, battery saver turned on and screen brightness lowered to 120 cd/m2. Excellent readings – 450 minutes (7 hours and 30 minutes). Similar result but still outstanding – 429 minutes (7 hours and 9 minutes). Even at the most demanding test, the HP ProBook 440 G3 scored excellent result (6 hours and 11 minutes), although the laptop isn’t meant for gaming, let alone away from the charger. Fritz is a chess benchmark which tests the computing capabilities of the CPU with various chess moves. The Intel Core i5-6200U managed to get 5.477 million moves per second. For comparison, one of the most powerful PCs, Deep(er) Blue, was able to squeeze out 200 million moves per second. In 1997 Deep(er) Blue even beat the famous Garry Kasparov with 3.5 to 2.5. This is a two-staged test that doesn’t represent real-life situation because it’s quite unlikely that the general user would reach 100% CPU + 100% GPU load for long periods of time, but it’s still a good way to determine the effectiveness of the cooling system and the overall stability of the system in the long run. We start off with 100% CPU load for an hour and the silicon reached around 75 °C, which is pretty far from the maximum allowed temperature of 100 °C and now thermal throttling occurred – 2.7 GHz was the constant operating frequency for two active cores. 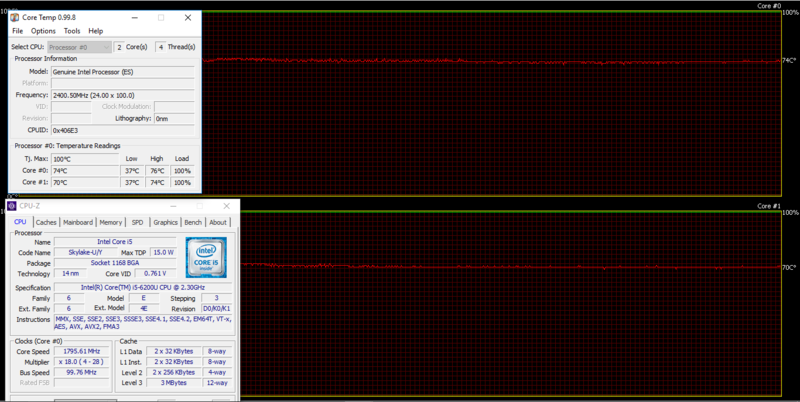 You can see the red line below representing the temperature and the green line that stands for CPU load. After this, we started the GPU stress test as well and quite expectedly, the CPU started throttling to give some headroom for the GPU to operate at higher frequencies. However, the temperatures were still around 75 °C and the CPU was running around 1.8 GHz. This is quite common for laptops with integrated graphics so there’s no need to be alarmed. Temperatures on the surface were quite acceptable and even prolonged extreme conditions, the surface remained cool without affecting the user experience. However, just like every product, this one has its flaws. We truly understand that the image quality isn’t the top priority when building a business laptop, let alone priced as entry-level. Still, the sRGB coverage is just 60% and the maximum brightness of just 226 cd/m2 will be insufficient for some users when working outdoors or near a strong light source. And last, but definitely not least, the display flickers from 0 to 99% with really low frequency (200 Hz). The latter is considered to be aggressive and will most likely affect even users with not so sensitive eyes. The Pulse-Wave-Modulation Aspect worries me, since I already have bad eyesight. Too bad, since otherwise it seems like a very good budget laptop. Oh, I just saw that you tested the TN panel with 1366 x 768. There seems to be a version of the Probook 440 G3 with an Full HD Panel 1920 x 1080. I wonder whether the PWM problem exists here too? Unfortunately, no. We haven’t tested the FHD config. Great review ! 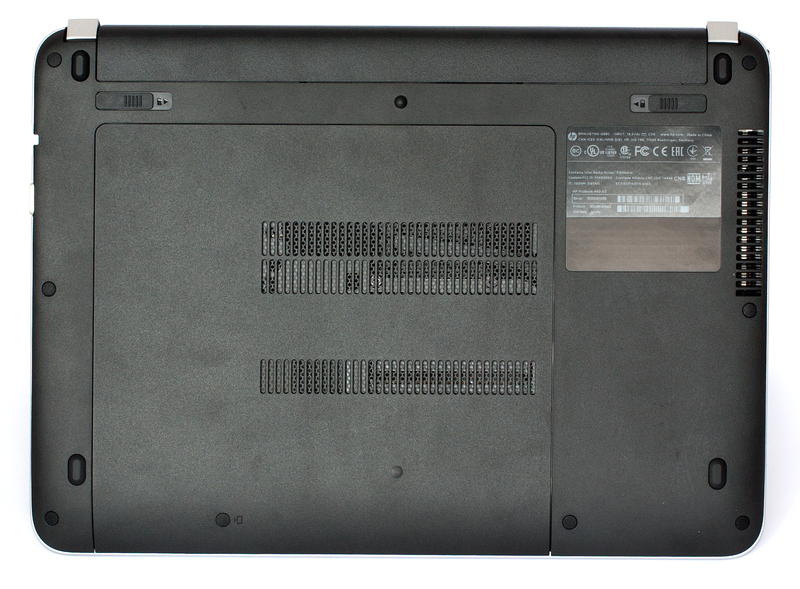 Probably the only extensive look at the Probook 440 G3 available on the internet. RAM Consumption very high, Open too many Microsoft Office outlook, word, power point , lacking..
Have been using this model for about 3 months now and the screen has cracked. Placed three sheets of paper in between and closed it to take it to class only to discover it has cracked when opened later. The laptop overall is okay, however, a little to sensitive for me.